A great update on Callum Watson’s post-surgery recovery. The provisional Cross Country Skiing National Teams for 2014-2015 have been released by SAXC, the cross country committee of Ski & Snowboard Australia. The four Sochi 2014 Winter Olympians, Phillip Bellingham, Callum Watson, Esther Bottomley and Aimee Watson, have been selected to the World Cup Team based on their results over the past twelve months. Four athletes have been selected to the Continental Cup Team; Paul Kovacs, Casey Wright, Anna Trnka and new team member Jessica Yeaton who is only one result shy of making the World Cup Team. Similarly there are three athletes (corrected Sept 17) in the U23 and Junior Teams, Jackson Bursill, Xanthea Dewez and Katerina Paul, who are also part qualified to the Continental Cup Team. Athletes can move up teams during the northern hemisphere winter based on their performances in FIS competition. 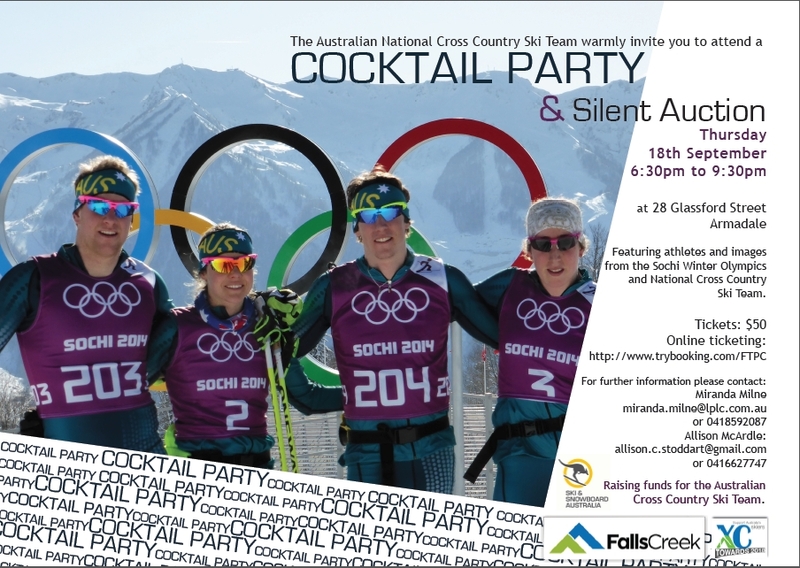 On Thursday September 18 the Ski & Snowboard Australia Cross Country Committee invites you to a Cocktail Party in Armadale in Melbourne. The evening will be a celebration of Australian cross country ski racing, featuring athletes and images from the Sochi 2014 Winter Olympics and Australian Cross Country Ski Team. A range of goods, services and other offers will be also available at a silent auction, with all proceeds going to the XC Towards 2018 fundraising project. Tickets are available via the Try Booking website. Click on the image below for more details.